Accurately simulates the light output of a real television. You've heard of keeping lights on when you're not there, even getting timers to turn the lights on and off at certain times. These are good things. You can now also have your TV turn on and off when you're gone. When you look at a real TV, you see images on the screen. But when you look at the light it casts in a room, the light from the screen melds to a uniform glow that changes with the changing images on the television. 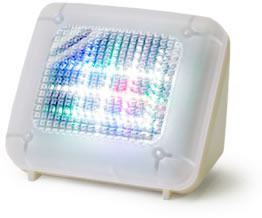 FakeTV uses a built-in computer to control many super-bright LEDs to produce light of varying intensity and color that lights up a room just like a real television does. The light effects of real television programming - scene changes, camera pans, fades, flicks, swells, on-screen motion, and more, are all faithfully simulated by Fake TV. Just like a real TV, FakeTV fills a room with color changes, both subtle and dramatic, in thousands of possible shades. Like real television programming, FakeTV is constantly shifting among more and less dynamic periods, more vivid and more monochromatic, and brighter and darker scenes. FakeTV is completely unpredictable, and it never repeats. Have you ever experienced the terror of thinking your child is missing or lost? We have all had the gut-wrenching feeling of turning around in a busy street and finding that our child is nowhere in sight. Now this can be prevented with the new and improved Child Guard. The electronic child leash lets you know if your child roams further that you're comfortable with. 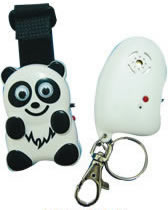 Worn by the child, the cartoon animal-shaped transmitter sends a constant signal to the receiver, which is held by the adult. The child monitor signal is adjustable - from a distance of 6 to 30 feet, so when the child goes beyond the set distance, the adult's receiver starts to beep, letting them know that the child is starting to wander off. The Cutting Edge of new microchips produced by SMT® technology, also referred to as the IC unit, is wafer thin and performs with superb accuracy and is incredibly reliable. The IC unit is nicely hidden in a small plastic animal (looks like a toy) and can be concealed very easily under a shirt or jacket if desired.